The concept of the “constellation”, applied to literary and cultural studies broadly construed, describes the relations that link ideas to things. In this context, the idiosyncrasies of things push back against universal tendencies assigned by ideas. These relations are based on the accumulation and classification, not on a hierarchical ordering. Ideas are to objects as constellations are to stars. This means, in the first place, that they are neither their concepts nor their laws. They do not contribute to the knowledge of phenomena, and in no way can the latter be the criteria with which to judge the existence of ideas. The significance of phenomena for ideas is confined to their conceptual elements. Whereas phenomena determine the scope and content of the concepts with encompass them, by their existence, by what they have in common, and by their differences, their relationship to ideas is the opposite of this inasmuch as the idea, the objective interpretation of phenomena-or rather their elements-determines their relationship to each other. Ideas are timeless constellations, and by virtue of the elements being seen as points in such constellations, phenomena are subdivided and at the same time redeemed. Benjamin’s figure of the constellation offers an alternative model for organizing things in the field of knowledge that helps us avoid the Platonic-Kantian pitfall of rooting recognition in the division between noumena and phenomena. The constellation breaks out of this dualism by demonstrating the interdependency between things and ideas. As the author of the encyclopedic entry for Constellation David Carniglia writes, “Things should be organized in such a way that they gave rise to ‘ideas’. But ideas are not radically separate from objects.” In other words, things are not derived from absolute ideas, but ideas themselves constitute the very source for the materiality of things. Contrary to Plato’s notion of the idea, Benjamin recognizes ideas’ material entanglements that link aesthetic sensibility with the material appearance of the object as historical artifact. This very linkage justifies the astronomical metaphor of the constellation as a starting place for revising the very concept of history. In Arcades Project, his “constellational” history of nineteenth-century Paris, Benjamin describes the mediating function of the constellation as that which is impermanent and based on a violent act of intrusion, disrupting the cause-and-effect logic of historical recognition that underlies all Enlightenment thought favoring causality and linearity. The constellation as an approach to history has implications for the scholar’s mindset as well. His opinion is no longer an antiquarian reconstruction, but the compilation and collation of heterogeneous historical elements derived simultaneously from the present status of the historical phenomenon, and the contemporary condition of its researcher. It’s not that what is past casts its light on what is present, or what is present its light on what is past; rather, image is that wherein what has been comes together in a flash with the now to form a constellation. In other words, image is dialectics at a standstill. For while the relation of the present to the past is a purely temporal, continuous one, the relation of what-has-been to the now is dialectical: is not progression but image, suddenly emergent. The relativity of the constellation emphasized by Giedion dovetails with Benjamin’s findings, according to which ideas appear to the scholar and critic as meaningful within complementary and variable systems and entanglements. Benjamin’s spatial metaphor discards the binary opposition and underscores the need for a simultaneous understanding that would include materialist vision. Within this conception of the constellation, the act of reading becomes the only condition for the work of art, for the practice of reading reveals itself to be embedded in historical consciousness while offering itself as a tool for discovering that which remains unsaid about the work. In the constellational mode of reading proposed by Renée R. Trilling, each poem of medieval Anglo-Saxon poetry read in this way is a fragment of the past that demands recognition in its own material form through a simultaneous assessment of its aesthetic value. Both these mandates can be enacted precisely through the constellational practice of reading, historicity, and the autonomy of the thing. As a constellation, the act of reading allows one to unveil the politics of time and to reactivate that which, due to differently politicized moments, necessarily became cut out and forgotten. Trilling writes that the gain of constellational reading is the discovery of the truth “not in the work itself, but in the constellation […] Truth resides in the tension between the similarities and differences, extremes and averages, which comprise the constellation-as such.” Thus, the fruits of reading amount to the discovery of complex discursive practices that have determined and continue to determine, in the reader’s own moment, the interpretive status of the original literary text. By departing from Benjamin’s “mysticism” of the constellation, passing through Adorno’s materiality and heterogeneity of history, and arriving at a constellational model of reading, we can shed light on this concept’s movement through the humanities. To use Mieke Bal’s formulation, this “travelling concept,” which made its way into the methodologies of literary studies from a critique of the Enlightenment’s vision of history as a linear process of recognition, ultimately defines the reading process as a “continuous oscillation between the individual’s realm of human history and the artifact’s place in the history of objects.” An invaluable benefit of adapting the constellation metaphor to literary studies is the capacity to locate the act of interpretation within the scope of this oscillation, which is simultaneously the battlefield of heterogeneous forces. The constellational act of reading, meanwhile, leads to their unveiling and to the exposure of the imprint they leave on the work of art. Encountering the literary text within a constellation of other texts and their anachronistic interpretation not only allows us to recognize its inconsistencies and antagonisms as the effects of the historical transformations of reading, but to recognize Benjamin’s sense of the “intransient” not as a universal, timeless and therefore indisputable category, but as the effect of discursive forces rooted in the totalizing exertions of concepts. This short genealogy of the “travelling” constellation metaphor does not exhaust its potential as a research method for the human sciences. The concept of the “critical constellation” proposed here includes the concept’s applications identified here, while revising the points of its trajectory and locating discourses of literary critique within the field of the “material artifact”. This displacement not only allows us to step beyond the “silence of things”, as Trilling has proposed, but also allows us to develop new forms for the visibility of critical discourses. Among these forms, the act of laying bare the conditions of critique deserves special emphasis. This does not entail the historical reconstruction of the reception of literary texts, but the unveiling of the historically materialized status of critical languages. The concept of the constellation has already been discussed in Polish scholarship within the context of critique. In his writing on literary critique as the object of historical and literary studies, Janusz Sławiński has described a collection of texts “constituted through mutual references to the work itself using the term ‘constellation’. Sławiński has recognized the constellation as “one of the most natural ways of grouping critical claims” and for the more pronounced whole from one critic’s set of claims on various subjects, because the whole collects the “elements of diverse literary facts.” Michał Głowiński has also invoked these claims, introducing a constellation of “emancipations”, and emphasizing even in his introduction that “the constellation has much to say of the critical texts that affirm its own concept, and comparing critical works on one artifact might allow us to demonstrate distinctions and points of contact, drawing to the surface the critical styles that crystallize out of the writing amassed around one object, but also the various forms of understanding for a critical entity, its functions and responsibilities.” In keeping with this claim, he demonstrates the idiosyncrasy of critique tied to the work of art and argues that the most important properties of an epoch’s literary critique are reflected in a constellation of “emancipations”. According to Głowiński, it is quite clear moreover that the biggest impetus for these “revelations” was Wyspiański’s work. Głowiński argues that Wyspiański’s originality stimulates interpretive ingenuity to confront a broad and diversified set of themes and the demonstration of one’s critical craft. By linking analytical precision with comparative studies and an expanded conceptual context, the Warsaw scholar’s excellent observations hone in on the study of a given epoch’s literary critique. A certain statement might simultaneously be subject to various interfering categorizations: this is an element of the “constellation” co-creating the literary fact, and a component in the development of a given critic. It belongs to a set of texts representative of a certain critical school, and falls in with a group of statements in consensus on the formulated poetics of a given movement, and so on, and so forth. Each time, the statement is situated differently in the classification of the historical literary process. According to Sławiński, critical statements taken within a constellation become crucial components of literary fact, or of the whole, which consists of the work together with its reception under defined social and literary conditions. The Warsaw theorist thus places special emphasis on the fact that only the whole (and not simply the work of art) inclusive of diverse and many-sided relations is a proper entity for the historical literary process. Scholarship on literary critique pursued by these tenets must “effectively engage an integrated history of literature”. It thus becomes embedded in the main foundation for reconstituting the former relations for a historical and objectivized reconstruction. 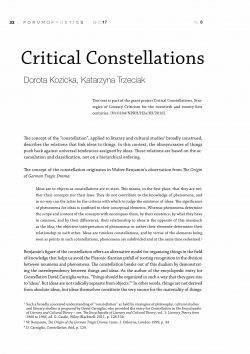 In the model of critical constellations proposed here, Sławiński’s nuanced observations assign a critical role to the many-sided relations between the literary work and the texts that reference it, between the very texts of the constellation and between these texts and the “voiceless judgment of the audience”. This fundamental understanding of both the critical constellation itself as well as the objectives of its research is radically distinct. What’s more, the stakes of building a constellation thus construed are not so much the demonstration of how our form of understanding a concrete literary work changes over the course of our interaction with it, or by what means and how intensely a work of art becomes known. Nor is our objective, as Sławiński might wish, the co-creation of a history of literature through historical critique. The stakes are in fact critique itself and the status of critical languages as revealed through contextualizing diverse conditions and contingencies beyond the constellation. This constellational model of a history of literary critique does not reduce literary critique to a discourse secondary to literature (as it is situated within the reception history of a given work of art), nor does it reduce critique to a means for expressing/formulating concrete philosophical, political, social and cultural ideas (as might happen when we trace literary critique by defining movements or literary programs), nor does it reduce critique to the level of meeting concrete objectives (be they political, programmatic or personal). This model allows us, rather, to mobilize the relations between individual texts and the academic perspectives that these texts mobilize in order to locate their mutual and ever-changing systems and linkages. This model enables us to simultaneously grasp literary critique in its individual moments of exposure, which is to say, within specific texts of literary critique ― as an inscribed testament of reading that aggregates within a historical moment the means for interpreting a literary text, the reader’s expectations, the criteria of its evaluation, the positioning of literary critique on the field of literature, and the choices made by the critic herself. 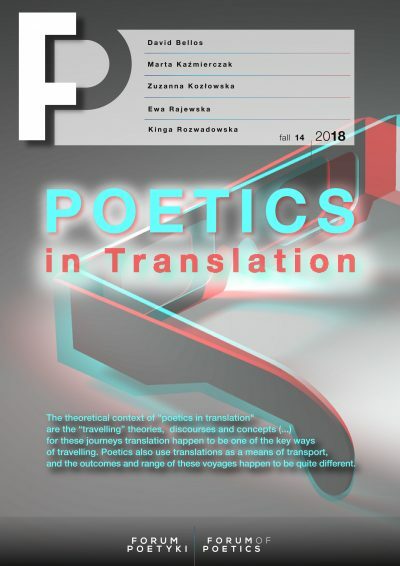 Additionally, within constellational systems, as a “shimmering”, transient whole in which texts of literary critique reveal their interrelational meanings, entanglements, limitations and ambitions, while “reflecting” meaningful thought trajectories and determinations in the literary field (eg. which foundational categories for reading literature appear in such constellations and by what conditions? Who is writing, where are they writing, and how is this act positioned against the literary spirit of their time? What is the range and context of the reception of a concrete literary text, and how does this coincide with political and attitudinal categories? How do the perspectives of the scholar’s present moment modify the weight and meaning of individual critical texts?). This article’s objective is to apply the astronomical metaphor of the constellation to the study of literary critique. Departing from Walter Benjamin’s concepts that have been instrumental to the status of the “constellation” as a concept, and using this metaphor to reflect upon the study of history through Adorno’s revisions that usher the constellation into aesthetic studies, as well as the constellational model of reading proposed by Renée R. Trilling, and historical methods for applying this metaphor to Polish critical studies, this essay attempts to introduce the constellation as a means for grasping literary critique without deferring to totalizing and monolithic classification systems. The article demonstrates that the “critical constellation” allows us to yield a certain autonomy for critical discourses by simultaneously revealing their relativity and their multidimensional entanglements with the conditions of the literary field (including the present moment of the scholar). The article proposes the constellation model for studying literary critique. This text is part of the grant project Critical Constellations. Strategies of Literary Criticism for the twentieth and twenty-first centuries. [Nr 0184/NPRH/H2a/83/2016]. Such a broadly conceived understanding of “constellation” as held by strategies of philosophy, cultural studies and literary studies is proposed by David Carniglia, who provided the entry for Constellation in The Encyclopedia of Literary and Cultural Theory – see. The Encyclopedia of Literary and Cultural Theory, vol. 1: Literary Theory from 1900 to 1966, ed. G. Castle, Wiley-Blackwell: 2011, p. 128-130. D. Carniglia, Constellation, ibid, p. 129. W. Benjamin, The Arcades Project, , trans. Howard Eiland and Kevin McLaughlin, Cambridge 1999, p. 477. D. Cerniglia, Constellation, ibid, p. 129. Adorno’s doubts were provoked in particular by two aspects of Benjamin’s understanding of the constellation – his assertion of the discrete character of ideas and concepts, by which concepts mask their own status as concepts, and the supposed “timelessness” of the constellation. Adorno highlights this second aspect, explaining that if the relations between stars constitute an entity of the constellation, then their “timelessness” is inevitably embedded in historical permeability – see. S. Jarvis, Constellations: Thinking the Non-identical [in:] ibid, Adorno: A Critical Introduction, Routledge: New York 1998, p. 176. Mieke Bal describes “travelling concepts” as flexible, for they “travel – between disciplines, between individual scholars, between historical periods, and between geographically dispersed academic communities. Between disciplines, their meaning, reach, and operational value differ.” See M. Bal, Travelling Concepts in the Humanities: A Rough Guide, Toronto 2002, p. 24. R. R. Trilling, Ruins in the Realm of Thoughts, p. 147. J. Sławiński, Krytyka literacka jako przedmiot badań historycznoliterackich, [in:] Prace wybrane, vol. IV, Kraków 2000, p. 149-150. M. Głowiński, Konstelacja “Wyzwolenia”, “Pamiętnik Literacki” 1990 issue 2, p.35. J. Sławiński, Krytyka literacka…, p. 147. T.W. Adorno, Negative Dialectics, trans. E.B. Ashton 2004, p. 163. The constellation illuminates the specific side of the object, the side which to a classifying procedure is either a matter of indifference or a burden.” – T.W. Adorno, ibid, p. 162. R. Nycz, Lekcja Adorna, p. 44. Nycz demonstrates that there is no way to translate constellational analysis into method, for the constellation is too dynamic, flexible and idiosyncratic.